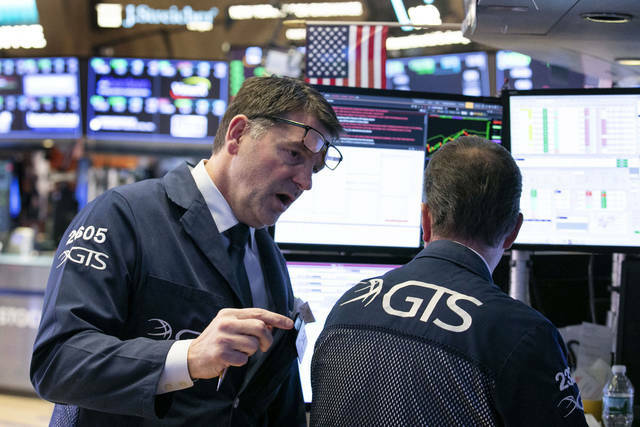 NEW YORK (AP) — Stocks powered higher Wednesday after the Federal Reserve signaled it could hold off on interest rate increases in the coming months, citing muted inflation. The Fed’s announcement allays one of the biggest concerns for investors: That the economy, and corporate profits, could be hurt if the Fed continued to steadily increase interest rates after raising them four times last year. Technology companies drove the broad rally, which snapped the market’s two-day losing streak. The benchmark S&P 500 index is now track to end January with its biggest monthly gain in more than three years, and the gains pushed the Dow Jones Industrial Average above 25,000 points for the first time since early December. The aerospace giant soared after blowing away analysts’ forecasts for earnings and as its annual revenue topped $100 billion for the first time. The gain in Boeing’s stock accounted for about a third of the 434-point gain in the Dow Jones Industrial Average. The Fed’s benchmark short-term rate will remain in a range of 2.25 percent to 2.5 percent after having been raised four times last year. The central bank also said it is prepared to slow the reduction of its bond holdings if needed to support the economy. That would put downward pressure on long-term interest rates such as mortgages. Apple rose 6.8 percent to $165.25 after traders brushed off a slide in iPhone sales. The technology giant’s latest results met Wall Street’s diminished expectations. Anthem, the nation’s second-largest health insurer, soared 9.1 percent to $297.56 on an upbeat forecast for 2019. Corporate earnings have so far been holding up in the face of the global slowdown and trade conflicts. So far, roughly a quarter of the companies in the S&P 500 have reported results for the final three months of 2018. Of those, some 77 percent delivered earnings growth that topped Wall Street’s expectations. Some, though, are lowering expectations for 2019.